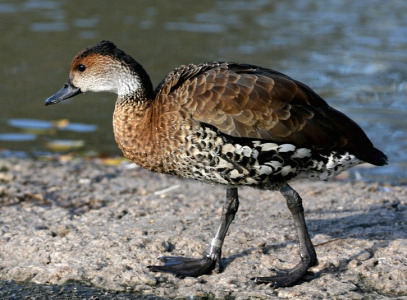 Wildfowl Videos - Dendrocygna Arborea West Indian Whistling Duck Video - Wildfowl Photography. Appearance - The West Indian Whistling Duck is larger and plumper than other Whistling Ducks. It has a dark brown head, with black crown, and nape, chin and throat are pale buff, lower neck is speckled with dark brown, upperparts and breast are dark brown, flanks are pale buff, underparts are heavily spotted, the beak is black, and feet and legs are greenish-black. Boths sexes look similar. Notes - The West Indian Whistling Duck is also sometimes called the West Indian Tree Duck. They can often be found perching in trees and they feed during the night. Due to hunting and wetland draining these ducks are currently in decline and are currently considered vulnerable.